Photos and baseball card courtesy of John Wroblewski. John Wroblewski (left) chatw with old South Chicago neighbor Rick Stelmaszek (right) during a visit to Minneapolis’ Target Field. 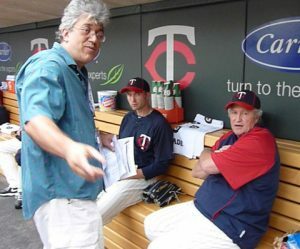 Rick Stelmaszek garnered deserved respect at the longest tenured Minnesota Twins employee and the third-longest serving coach, at 32 years, in big-league history. 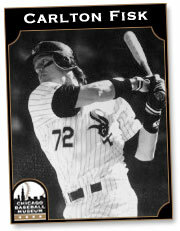 But it was then-catcher Stelmaszek’s cup-of-coffee as a Chicago Cub that I brought up whenever I’d say hello to “Stelly,” his nickname known to all in his innumerable visits back home to Guaranteed Rate Field, nee U.S. Cellular Field, and built in 1989-90 as new Comiskey Park. And he had 10 seasons coming through the original Comiskey Park across the street. I witnessed Stelly’s sole big-league homer off Hall of Famer Don Sutton in a lost-cause game on Aug. 20, 1974 at Wrigley Field. The last of four catchers the Cubs employed in that 96-loss, last-place season, Stelly’s blast reached the catwalk with a man on in the sixth inning. Over the decades, other accounts no doubt have the blast lengthening ‘til it banged off a building on the other side of Sheffield Avenue.